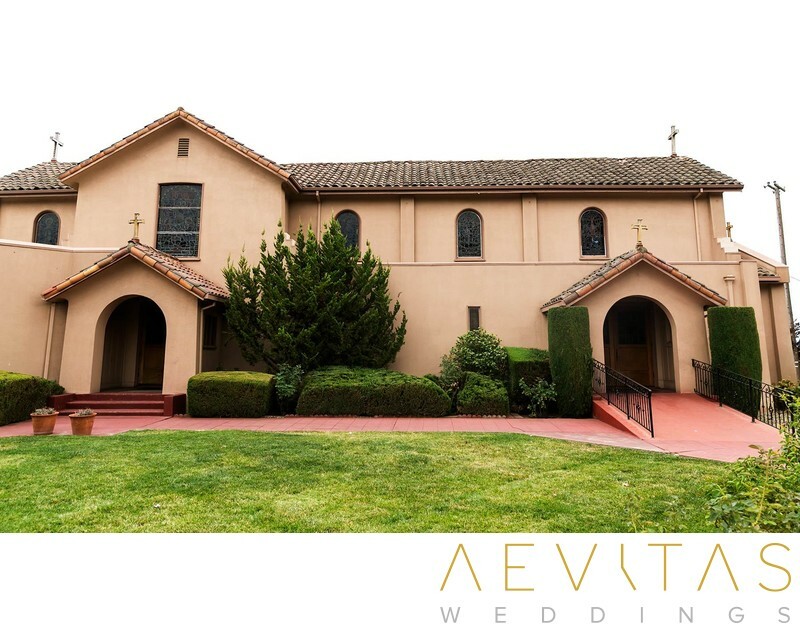 Situated in the beautiful Napa Valley wine country in the town of Yountville, Saint Joan Of Arc Catholic Church is an idyllic wedding ceremony venue for couples wanting to incorporate their faith into a vineyard wedding celebration. It can hold up to 170 guests, seated in its classic wooden pews, or a stand-up wedding reception of 250 people. Be greeted by its elegant Spanish-tile roof and leafy green courtyard, all set within sweeping vineyard landscapes. Then walk down the aisle between family and friends towards your loved one and the crucifixion cross that dominates the altar. The Saint Joan of Arc Catholic Church features beige stucco walls which naturally reflect the light that pours through its elongated stained-glass windows, meaning wedding photos are well-lit and exposed, without the need for flash photography. There is also a second floor balcony which enables your photographer to capture multiple perspectives of your ceremony, as well as the flexibility to shoot wedding photos from either side of the altar. If you are only planning to hold your ceremony here then you will have access to the church one hour before, with some time to capture couple portraits, bridal party portraits and family formals either before or after you exchange vows. You can stage wedding photos right in front of the altar for a more traditional look, or in the leafy exterior courtyard, with views across to the vineyards in the distance. For couples planning to hold their wedding reception at Saint Joan of Arc Catholic Church, keep in mind that all catering and beverages must be brought in, and the reception must end by 10pm in the evening. Or for those planning to hold a more lavish banquet and party into the early hours, there are a number of nearby wineries and venues where you can easily do just that.